First Line: Death arrived at the party dressed in the traditional way. Local Member of Parliament Barrington Jenks is suspected of having been involved in the disappearance of two teenaged girls twelve years ago. Detective Chief Inspector Emily Thwaite and Detective Inspector Joe Plantagenet are asked to investigate this allegation, and they both know they have to tread very carefully. They've barely begun when a university student living at 13 Torland Place vanishes. Emily and Joe are puzzled when they learn that 13 Torland Place is not only linked to the disappearance of the two girls twelve years ago but was also where a mass murderer killed five people in 1868. These two skilled investigators aren't about to believe that this is just a bizarre coincidence. When the university student's body is found and another woman goes missing, it looks as though the city of Eborby has a serial killer haunting its streets. 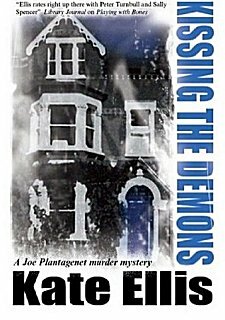 If you enjoy a good, solid police procedural with strong Gothic overtones, you should like Kate Ellis's Joe Plantagenet series. As she does with her excellent Wesley Peterson series set in the south of England, Ellis skillfully blends history with a present-day crime. Eborby (based on the city of York) has a long history which is perfect for the book's Gothic atmosphere. Thwaite, assertive, likable, and with a husband and family is an interesting pairing with the intellectual yet compassionate loner, Joe Plantagenet, who once studied for the priesthood and is much more attuned to the things that go bump in Eborby's darkness. In this third book in the series, we learn more about both characters' lives-- especially Joe's when his late wife's sister comes to town. The story is complex and suspenseful, due in large part to the fact that there are so many people who have a lot to lose if their secrets are revealed. Although it is the third book in the series, it can be read as a standalone; however, something tells me that you'll want to go back to read the others. The atmosphere, ancient buildings and narrow winding streets of Eborby alone are well worth reading more about. Pair this marvelous setting with a strong story and characters, and you have absolutely nothing to lose! This sounds so familiar, I thought I might have read it..but I think not. Good idea, Caite. I really enjoy this series!